Tungareshwar was declared a Wildlife Sanctuary in 2003. It is about 85 km sq of forestland. It is located on an altitude of about 2177 ft. 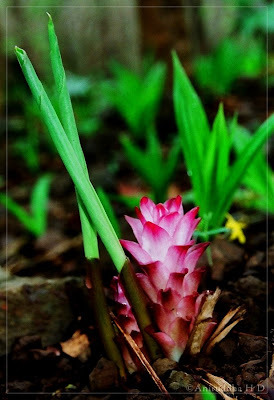 It is well known amongsts trekkers and nature enthusiasts and must be visited in the monsoons and winters. 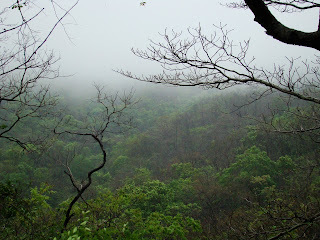 I had gone on a trail to Tungareshwar WLS when the monsoon just set it. 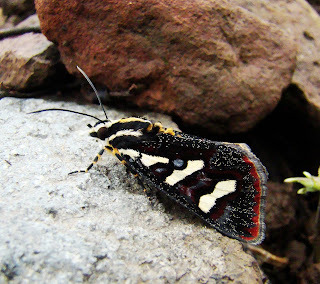 And this is the best time when one sees swarms of butterflies mud-puddling, and a variety of other critters. This year, the rain set in quite early, and brought to life a lush green world of nature. The birding was amazing, althought I'm not an avid birder, and the bug hunting was worth it. The terrain of Tungareshwar reminds me of Himalayan foothills, with those li'l bushes and shrubs and flowers on the meadows. 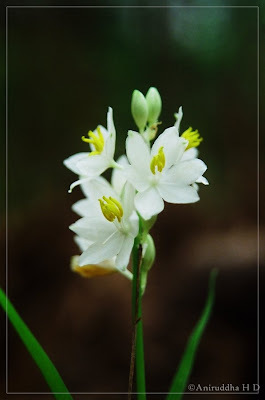 The landscape was full of Hill Turmeric - Cucurma pseudomonata, Edible Chlorophytum - Chlorophytum tuberosum and Yellow Ground Star - Curculigo orchioides, and young leaves laden with rainwater. When it comes to trails, I'm much of a head-down person, looking in the undergrowth, the leaf litter and rotting wood. And that's where you find jewels! And I mean, honestly, Tungareshwar is very rich in its undergrowth, and there's surprize in every leaf you uncover. So here's all that I could find at Tungareshwar WLS, and I already yearn to go there! 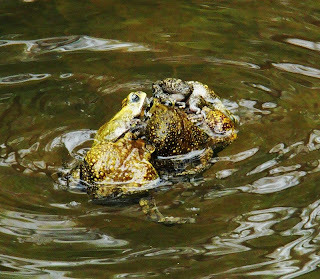 The best part of Tungareshwar WLS trail was the coraking of Common Indian Toads. It was so loud, and seemed to come from throughout a stream that ran down the gorge. We went off the usual way and down the mountain, and guess what we saw?! Look for yourself! 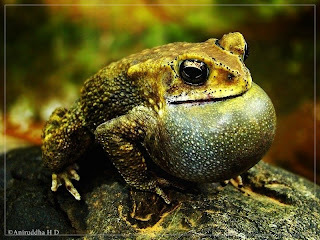 A Mating Ball of the Common Indian Toads! Although 'common' in it's name, the Common Indian Toad - Bufo melanostictus has been brought on a brink to exist-no-where-but-away-from-us. The once common toad was seen in swarms, mating away to glory! The croaking rang in our ears, and we spent some nice time photoshooting the aspiring male toads! We spent like an hour here, birding and clicking 'em, and hiked o'er the mountain back on the kuchha road. Over the road, in fact through out the trail, we found these super-sonic flying critters, cutting through our path, and on one closer inspection we found 'em to be the Tiger Beetles! There were so many of 'em, hunting, strolling, flying and mating, that I wanted to capture 'em through lens right away! And I got an opportunity to snap of a mating pair, with a kebab mein haddi! Now, these critters are supersonic, as I said, and why are they called Tiger beetles? 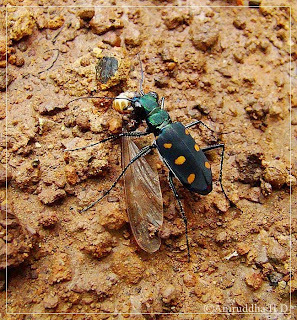 That is because they are active predators (see the far above pic of a Tiger Beetle feeding on a Flying Termite). They fly and hunt and are solitary much like the tigers, sometimes ambushing, giving a surprise attack. But, to my surprize, we did not find much butterflies! 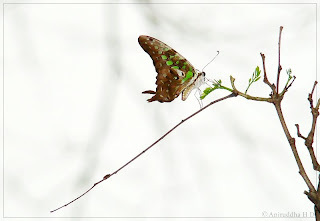 And the main reason for that is because the monsoon set in early, so all the mud-puddling session was over and out. We saw a few butterflies though, like, an Oak Blue, the ever-present Spot Sword Tails, and a Tailed Jay. 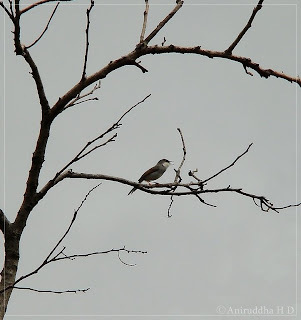 With not much luck from the critter-world, we strolled through the forest listening and watching the birds. It was a pleasant day, very windy, apt light for photography, and the birds were singing away to glory. Without much going on in the undergrowth, we saw a moth belonging to Agaristinae species, common throughout the forest, a noctuid, but one which is fond of light! And lastly, we saw a tiny jewel that would be crazy to miss. It's size was about 7 mm, very small, but managed to get a record shot. 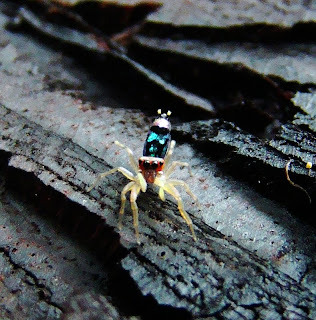 It was a Jumping Spider, species unknown to me. And to end a report on Tungareshwar WLS, I'd like to conclude that, with respect to the last year's Monsoon Trail, the sighting had been very few, althought the birds we saw were thriving happily, and this place still looks untouched, virgin (except for the way to the temple) and I hope it remains so for ages to come.